PRDD created a breakthrough in NOx scrubbing that has turned out to be the best available NOx control technology for many industrial applications. The breakthrough is the result of NOx abatement problem solving for a chemical milling company in Los Angeles, California. The firm had purchased and installed a single stage wet scrubber with the understanding that the device would meet their compliance requirements for NOx. 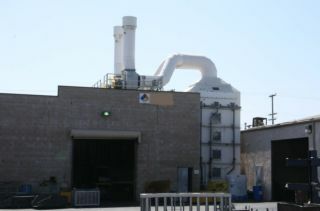 A detailed site study revealed the half million dollar scrubbing investment only treat about 10% of the NOx generated in the chemical milling industry’s waste gas stream and that would not meet the South Coast Air Quality Management District’s NOx control requirement. 1. Install two additional scrubbers as large as the one they had just built. 2. Invest in research that had promise of treating the NOx in a way that would not require the two additional large scrubber vessels. The client chose the second option and that led to the development of what is known today as the Know-NOx method. This process in now protected by a provisional patent and is made available for industries everywhere. The Know NOx technology is provided to clients as part of a total services package that allows clients to choose between having all aspects of the abatement issue handled or participating in the resolution process by completing some of the requirements themselves. The package includes everything from resolution of issues with the regulatory agencies and site specific engineered solutions which optimally meet client requirements to installation or project management followed by startup and training. The Know-NOx package also includes the supply of chemicals and ongoing equipment maintenance.